Wednesday 11th August 2010 had been a nice weather day so having escaped the office I headed to Kemble and met up with my gorgeous girlfriend Elly for an evening flight. 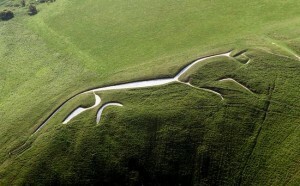 We had no specific plans so I suggested we go and find one of the Wiltshire white horses. We had a nice 1hr and 50 mins bimbling about the skies and included a fly around the White Horse at Uffington. Information on this prehistoric hill figure here. 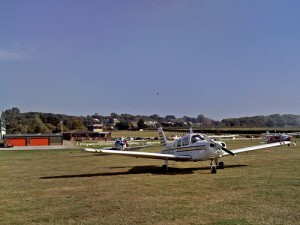 Sunday 1st of August 2010 was a lovely day, light winds and little cloud in the sky, so I took an afternoon bimble flight from Kemble along the M4 to White Waltham, just beneath the outer edge of London Heathrow CTA. White Waltham is a great historical airfield. It’s like stepping back in time. 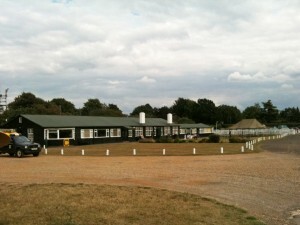 There are old wooden “nissen” hut style buildings, housing the bar and clubhouse etc. Outside you will find many old bi-planes being lovingly tended. Take a visit, sit on the seats on the white picket fenced lawn area outside the bar and watch the world go by like it’s 1930. 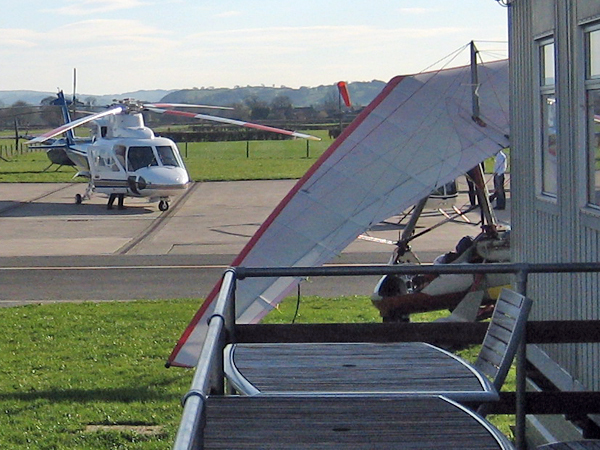 The West London Aero club website has more details. Do read the information before flying there, you don’t want to infringe and the Eastern half of the White Waltham ATZ is within the London Control Area Class A airspace. 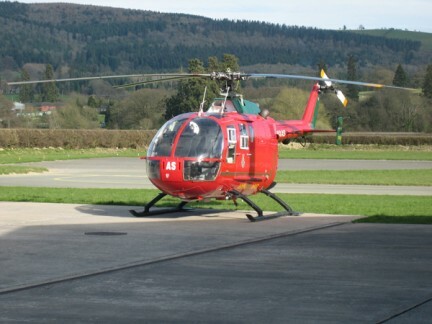 Trip to Welshpool and back. 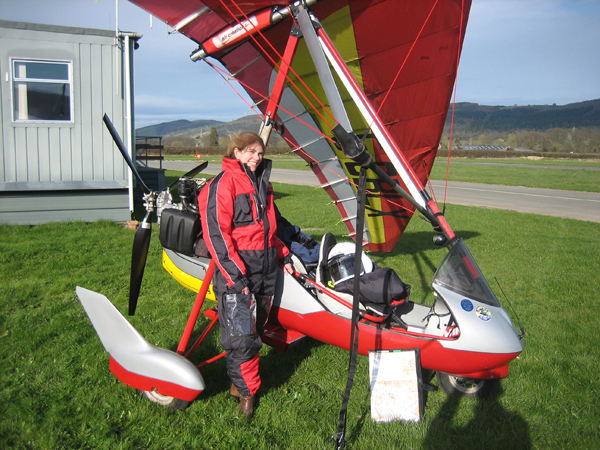 Sunday 11th April 2010 and it was considerably warmer than the last couple of times I’d flown, much to the relief of my passenger Elly. I’d made a couple of plans and we chose Welshpool. 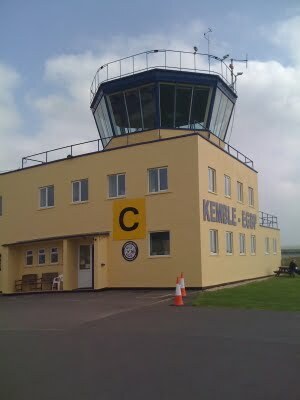 The outbound Kemble > Welshpool (Mid Wales Airport) took us 2hrs 10 flying time. On arrival we refuelled and then were told we could park right next to the “tower” window which is on the ground floor. Flexwingers, be aware, this sounds great and you can keep an eye on your machine and no distance to walk and grass to tie down into, BUT, it’s opposite the pumps and they have a few helis in and out refuelling, so tie down well or ask to park elsewhere ! Just beyond the “C” in the photo is the way in. Inside you find the desk to sign in and pay, cant recall, but it was reasonable. There is also a cafe serving standard bacon/sausage butties, breakfasts etc. Just ask if no-one there and they come and serve you. Also a vending machine too. Good views of the runway. Elly and I went for a wander along the Montgomeryshire canal towards town. It’s probably a 30 min brisk walk all the way into town. The area is beautiful and the fields along the canal were full of lambs. I do like my aircraft’s new accessory. (The luggage pod, what were you thinking?!). The return leg took 2hrs 05 and was pleasant until around Gloucester when it became more apparant the surface wind had picked up to a quite gusty crosswind, rather more than perhaps forecast. Arrival at Kemble was more arrival than landing. Unfortunately I bounced CBLX as a gust dropped in the flare, drifted sideways and contacted again before applying full power and going around. Second time far better but alas we had done damage. It transpires I must have used a lot of the shock absorber on the right side and that coupled with the engine being set at a slight angle (to counter torque) thus the spat that side being closer to the prop arc, amazingly amazingly allowed the spat and prop to have a very very brief discussion ! Only long enough for 1 blade to take a bit into the spat top corner, but not for the next 2 blades coming around ! So, that kind of spoilt a fantastic day out ! Anyway, some 8 weeks later after messed up orders and delays from French bank holidays etc, I had a new blade from Arplast. 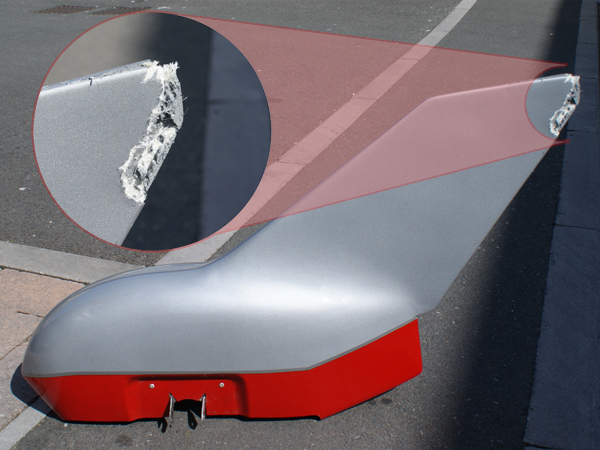 Also the fabulously talented Mark down at Galaxy Microlight, Wing Farm made my spat look good as new too with fibreglassing and respray. I’ll say! Calculate the time span that spat must have been in the prop arc to only damage 1 blade, very short indeed. So, visit Welshpool, check the weather, add more wind than forecast and as I am doing now, practice powered approaches lots when you have an aircraft you haven’t flown for that long yet, you might need to be good at them when you get home ! II’m at Wellesbourne with Elly. Nice flight here from Kemble in G-CBLX. Update later! (edit) Back home and months later !…..
We had a nice flight up to Wellesbourne Mountford airport (few miles East of Stratford Upon Avon). It was a lovely clear sunny March afternoon, we left around 1420 and spent 55 mins in the air on the outbound leg. At Wellesbourne there is a nice cafe serving a mix of snacks from bacon butties to sandwiches etc and cold/hot drinks. The cafe doors open onto wooden decking with views of the taxiway and runway, a nice place to sit and chill on a pleasant afternoon. There is normally quite a bit of activity. 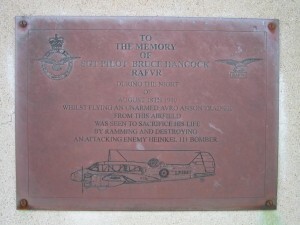 Wellesbourne also has a museum, which I have not been to yet but it looks interesting from walking by. There is also a based Vulcan undergoing restoration/preservation. Have a look at their website for more information and even if you are passing by as they have a LIVE weather page and even a controllable webcam so you can see for yourself ! It’s an airfield I’ve been to a few times before, the last time however was in Paul Hills Tanarg when I was getting to grips with it prior to flying on Fly-Uk with him in it. Since then of course I got the Air Creation bug and have my own Kiss 400 now. Anyway, Elly and I enjoyed a sandwich and tea (well I think Elly had seen better tea!) and we watched the activities for a while before mooching off home. The return leg was against the wind and took 1hr 20mins but we did do some bimbling off route including a lap or two around the fire service training college at Moreton-In-Marsh, very interesting from the air, multiple fake buildings, motorways etc etc for training. Altogether a good afternoon out. I reccomend Wellesbourne for a visit, always lively there and quite central so often not far off route on longer days out either. New permit, new suits, cold visit to Windrush! Time for a blog update I feel. Well the last month has seen G-CBLX permitted for the first time since I bought her a little under a year ago. I’m pleased to report she passed through fine with just one note, one corner of the radiator air scoop intake mesh had come loose. 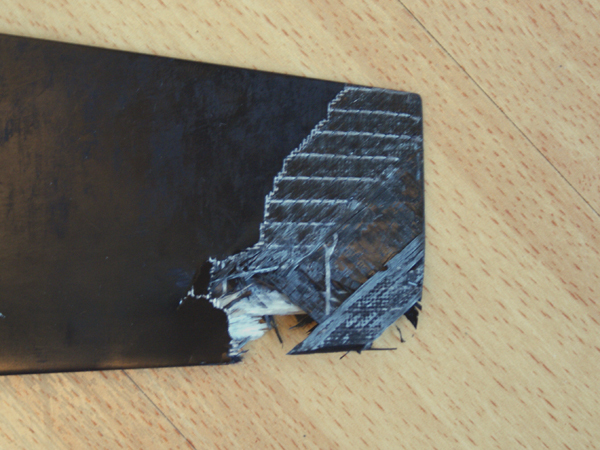 So that was quickly fixed with a little bending of the mesh and a re-tightening of the screw/washer in that corner. I must admit, I didnt enjoy watching the dreaded “betts” test. But the inspector said the wing was in great condition. Finally the weather has calmed a bit and the last few weeks I have got a couple of local flights in and some circuit practice to get my hand back in after a lack of hours flown this winter. I’ve dropped into the lovely ex ww2 airfield at Windrush a couple of times recently. 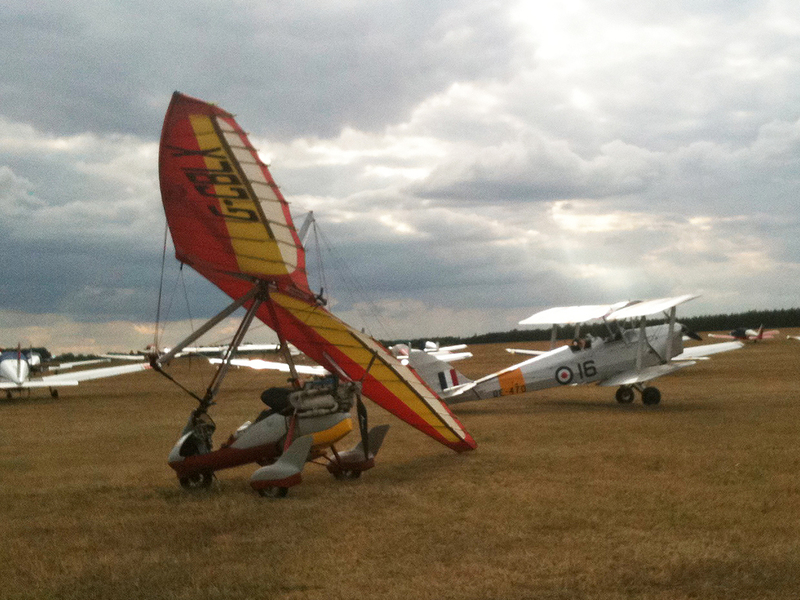 It’s a nice 30 mins bimble from Kemble to drop into and stretch your legs before flying back. Theres nothing much there apart from ghosts ! An old tower, a gun house and some old hangars now used as barns. 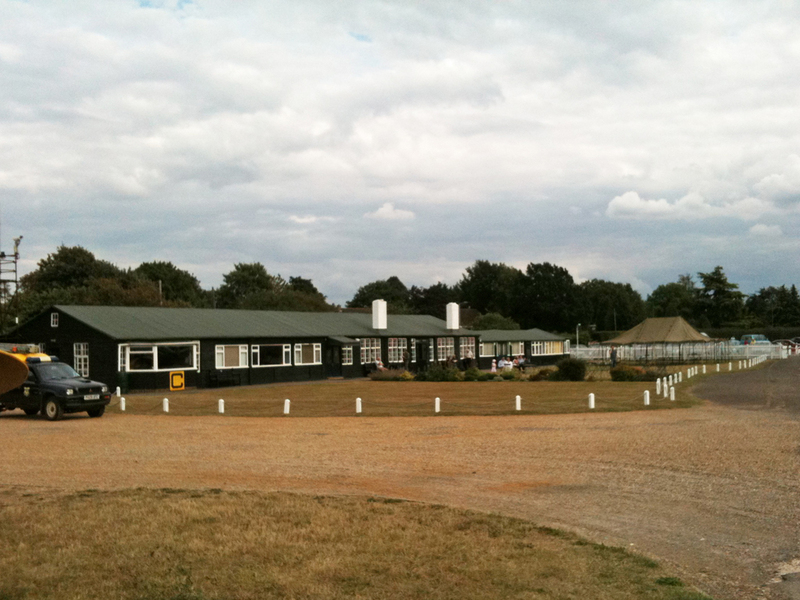 The tower was once refurbished and housed a skydiving/parachute club a few years ago but the airfield has no residents now. However, Roy the farmer very kindly keeps a grass runway mown most of the year, so if you drop in then bung £3 in the box in the bottom room of the tower (side door). If you bump into Roy he can tell you some history. 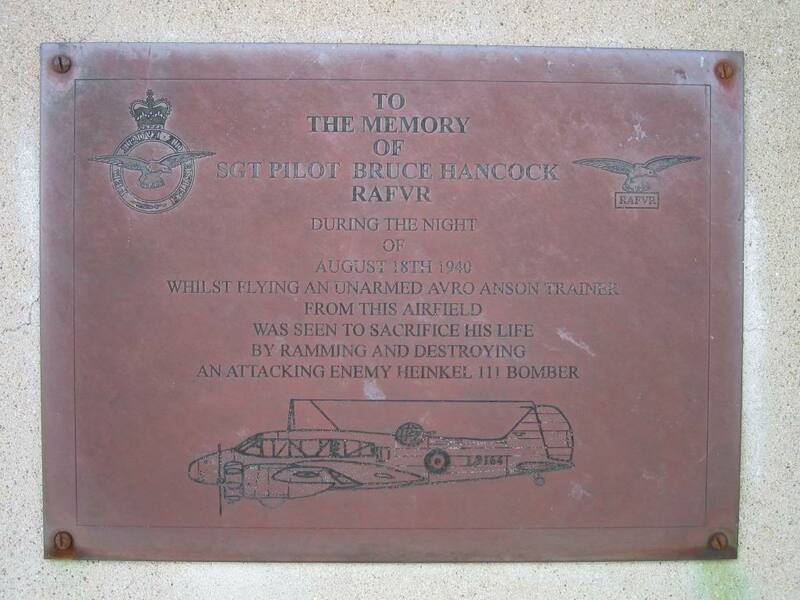 Also, look for the plaque on the tower wall commemorating a brave pilot who flew an unarmed aircraft into a german bomber overhead the airfield. There is some excellent information posted here in another blog/forum, well worth a read and more photo links. On Sunday I planned two possible flights, Kemble to either White Waltham or to Wellesbourne Mountford. As it happenned the wind was quite strong from the East so I decided to fly North to Wellesbourne rather than fight the wind. Elly my girlfriend was coming with me on her 2nd flight, the last was back in August. It was barely over zero degrees on the ground so we decided to fly to Windrush and see how we felt. Well, it was cold, despite several layers under the suits and balaclavas etc. So we thawed out at Windrush and flew back to Kemble. As it happenned it was a glorious blue sky sunny day and out of the wind it was not too cold. In fact we found a sheltered sun bathed area of patio and sat leaning on the old tower wall chatting and enjoying the peace and quiet and imagining how it would have been 60 years ago. Other news, blueskyblue are having a closing down sale, so I have ordered 2 new flying suits for us. We really are now set for the new season, bring it on. 10th October I flew to Northampton Sywell airfield to the home of Flylight who are the dealer for Air Creation aircraft in the UK. I’m writing this report some months afterwards so can’t recall much of the trip except that the weather was nice. The outbound leg took me 2 hours and 50 minutes, about 20 of which was on the ground. After waiting a shor while for Paul Dewhurst who was whizzing about in the sky with a student he duly landed and ambled over to say hello. I’d previously orderd a shiny new luggage pod for G-CBLX and he was expecting me to arrive so he could fit it for me. 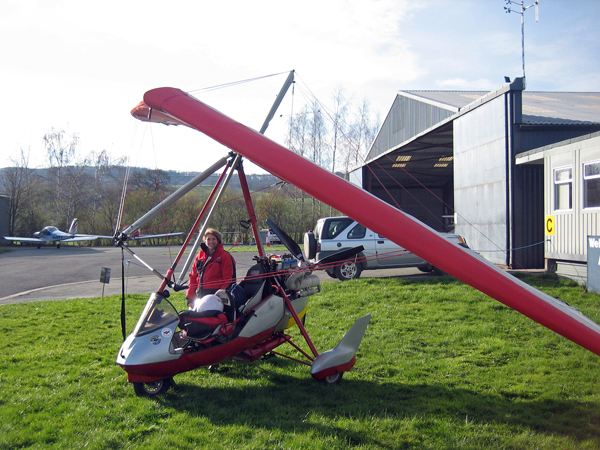 “Morning Ian” he said, “mmmm, your microlight is Red” he said looking bemused. “Mmmm, the pod they sent me is yellow” he said with a grin. Anyway, we sized it up and had a look, fortunatly I have a big yellow panel on the wing underside and actually it works quite well with the yellow pod ! We did a deal, they’d fit it for free to make up for the colour error. Fair play. Flylight are very very good on customer service. Thankyou. I’d now be able to fly with apassenger and stick tools and tent etc in the pod. Great for summer and Fly UK. 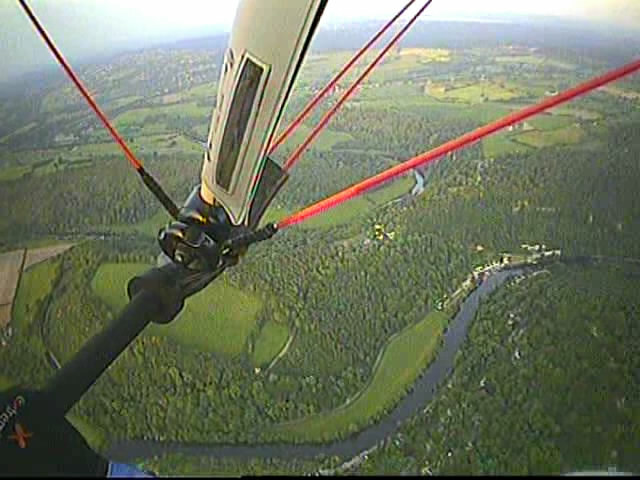 The return flight was 2 hours with the wind in my favour this time. 27th September was a lovely day and I’d planned a flight to the Isle Of Wight for some time. 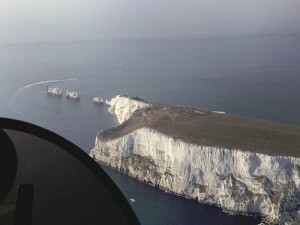 I’d been there before but that was on Fly UK, I’d landed at Sandown that time but decided to head for Bembridge for a change. I departed Kemble at 1040 and set off towards Popham in Hampshire where I planned to drop in for tea and refuel to give me enough for the rest of the day. 1hr50 later I was engine off at Popham and enjoying tea and cake in the sunshine. it was a busy day and there was lots to watch. Refuelled I departed around 1400 for a 1 hour flight to Bembridge. The weather was gorgeous and I took many photos of the docks at Portsmouth and the Solent as I tracked out to the island. (See the gallery). 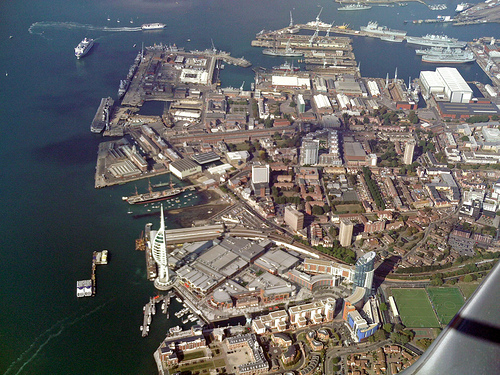 Solent Approach air traffic controllers were helpful as always providing me with a Basic Service until I changed to Bembridge radio and started my descent. Its always nice to have someone to work when crossing water even if the engine doesnt know you are doing so ! 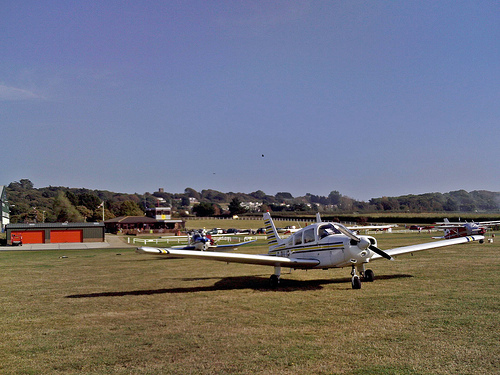 Bembridge was a nice airfield, easy to find, clean and tidy, nice club house serving food and drinks. I stayed just 45 minutes as I planned to cirumnavigate the island before heading home and time was a little tight to hang around. It seems many were thinking the same as I was number 5 in the queue for departure ! A mix of spam cans and microlights. All in all a grand day out and I look forward to maybe flying down on a Friday and spending a day or two there exploring. Their mission was simple, but audacious. They were to enter enemy skies, locate an airfield, land, liberate “The Red Sparrow” (G-CBLX) and return safely to England. At about 1030hrs The Grey Lady, fully fueled, rumbled (much like a Vulcan bomber doesn’t) down the runway and ambled lazily into the sky. As the controllers in the tower watched the aircraft dissapear from view, armed only with a map, a pen and some sweaty sandwiches from Tesco the valiant crew set a course to the West. Soon they would be leaving the skies of England and crossing into the Welsh skies, where even small farm strips are protected by Main Battle Tanks and bazookas. An hour later, as clouds gathered in the Welsh skies, the faint distant roar of The Grey Ladies HKS engine (and the slightly less faint rumble of the crews stomachs) could be heard approaching but (shock horror!) no-one was listening. At 1130 The Grey Lady in stealth mode suddenly appeared over the hills and swooped down onto the ground at Kemeys Commander airstrip. 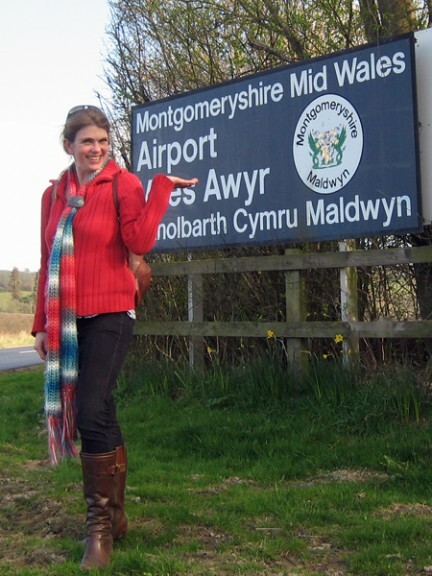 The crew rapidly disembarked, lterally pouring out of the flappy bungy cord secured doors onto Welsh soil. Totally surprising the enemy forces (they were having a natter by the hangar) our brave English boys rapidly set about liberating “The Red Sparrow” from the confines of the barn it was being held in. The operation was alas hampered by the embibing of a bottle of drink and the tesco sandwiches, but time was regained thanks to some aiding and abetting by friendly local resistance pilots. In no time at all The Grey Lady and Red Sparrow were out in the open making a run for it, despite the tough going (freshly moan, flat, quality grass) they successfully made a break to the far side of the open field. Ever mindful that the alrm could be raised any moment and a Soviet Main Battle Tank could round the corner of the hangars the bold English pilots frantically made last minute checks and finally…… just in the nick of time…..applied full power to their engines and roared down the runway…. lift off ! Climbing into the sky banking left to avoid any possible tank shells being launched by the airfield (and tank owner) Alasdair (only joking!) the brave formation of English aircraft headed back East seeking the safety of crossing the Severn estuary into friendly skies and the green and pleasant lands of England. Ok, enough of the drama…. I’ve made the decision to move out of Kemeys Commander and “Red Sparrow” is now based at Kemble in Woodside Hangar Number 1 – the Kemble Flying Club (Pegasus Flight Training) Hangar. I trained at Kemble with Kemble Flying Club on G-BYFF Quantum 912 and so it’s like coming home, only this time bringing my own aircraft with me. A big thanks to Neil Jones who kindly flew me from Kemble over to Kemeys Commander in G-STRG (“G String”) aka “The Grey Lady” an AX3 last Sunday so I could collect “Red Sparrow” G-CBLX without the hassle of trains/lifts etc by road to retrieve cars etc. The flight was nice, I hadn’t been in an AX3 before and enjoyed Neil’s company and good piloting. It was a lovely sunny day to start but cloud was bubbling up and there was some headwinf to fight on the way over to Wales, however things cleared up revealing more blue sky. It was a shame to leave the Kemeys Commander crowd, they’re a nice bunch whom I’d only really just started to get to know, but in the end the hangarage there wasn’t working for me and the Kemble opportunity was a no brainer. So, after an hour or so moving planes in and out and checking CBLX over, the Grey Lady and the Red Sparrow taxied and departed off 31 into the blue sky and turned East toward England. We flew in loose formation all the way back, a bit bumpier than before as the thermals had started and about an hour later we joined Kembles circuit. It was good hearing the familiar voices on “Kemble Information” and ending as I vacated runway 26 hearing “Golf- Lima Xray, taxi to woodside, welcome to your new home” from the FISO. The afternoon was spent helping to do some tidying and cleaning in the hangar and putting CBLX into her new parking spot. I also had a nice catch up chat with Mike Oakley over a coffee on AV8 terrace watching the never ending air show of mixed traffic that Kemble enjoys. Very nice to be back with the old faces and characters. Very nice to get such rapid responses to the appeal for a ferry flight. Very nice to be home. I think Kemble Flying Club with it’s decent new hangar and office at Woodside, (now with toilet!) coupled with Kembles top notch facilities of FISO, RFFS, Av8 Bar&Bistro etc is well set for a potentially bright future as a great place to train and a great club to be part of. I look forward to enjoying the hangar banter, watching the activity, being a total propellorhead and enjoying some good days out flying. Well, I collected Red Sparrow from Galaxy microlights a little over a week ago. Mark has done a cracking job, all tidy and he explained all the charges and work done too. 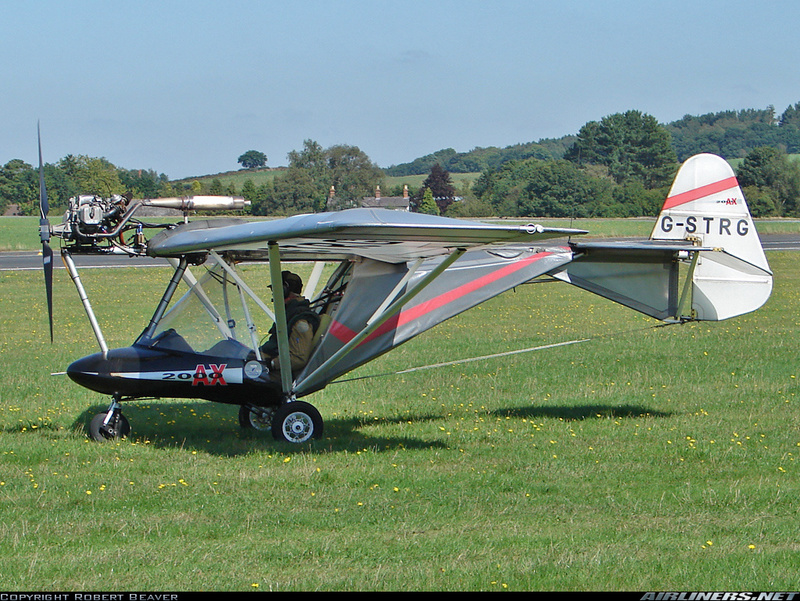 I would reccomend Galaxy Microlights. Last weekend I didnt get much more done than re-rig the trike and wing after trailering the trike back to Kemeys Commander. Alas the hangar is now fuller after my 4 week absence and a lot of time was spent shuffling other aircraft and a large truck about. I didnt get time to run the engine and then the weather was poor all week. 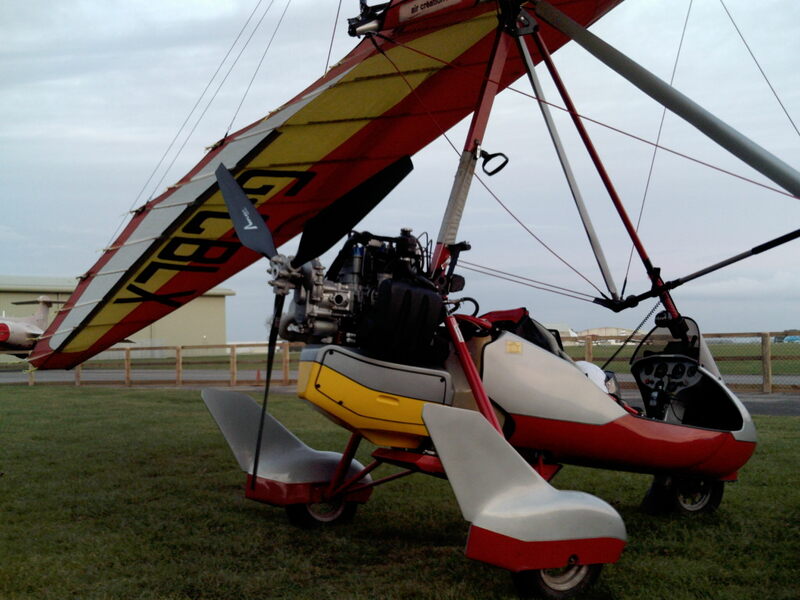 However, Saturday was nice so I headed over to the airfield and gave the trike a thorough check over, re-torqued the prop bolts and ran the engine for about 30 mins getting it up to temp, doing some fast taxis, checking the Ts&Ps etc. All seemed fine so off I roared into the air for a couple of circuits, not straying too far still a little nervous after all the whole engine had been in bits and you never know ! 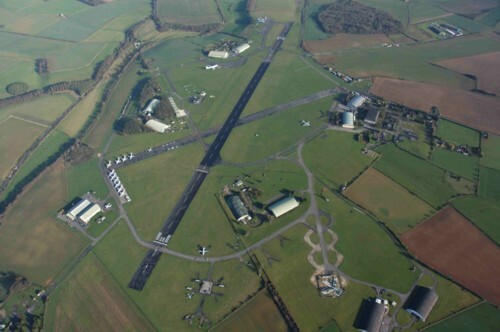 All was fine so after a short stop on the ground I headed off to my old airfield Kemble. En route I tuned into Filton Radar to listen out for other traffic and heard them talking to a C130 Hercules out of Lyneham, it was doing some general handling over the Severn Bridges. It’s always worth listening in, I was 2 miles from the bridges and heading for them so sure enough saw the “herc” doing some manouvres but he turned back towards home before I got over the estuary and bid Filton goodbye. Not long after I was flying over the quarries near the M5, the water in the bottoms shining back bright blue refecting the sky. Soon I could see Kemble and Aston Down. There were a number of gliders circling in the area. Tuning into 118.9 for Kemble Information it was clear they were busy, a couple in the circuit, a couple joining to land, one departing who soon passed below me toward Bristol. I called in after orbiting near Tetbury awaiting a gap in traffic and soon was entering the zone and overhead at 2000ft for a dead side descent and join for 26 hard. Once on the ground I asked for parking at Woodside hangars so i could pop into my old base Kemble Flying Club. 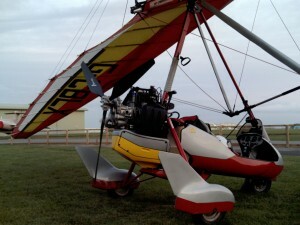 It was nice being “home” after a few months since I left and got my own microlight and moved to kemeys Commander. I enjoyed a coffee and natter with some friends and had a chat with KFC owner David and made some decisions. I’m moving back to Kemble. Kemeys is nice but too full now, not secure, not as weatherproof and I miss the constant busy flying of Kemble and its facilities. After coffee it was getting ominoulsy dark and cloudy and rainy looking out West towards the bridges so I got airborne. It was definately raining that way so i left the circuit promplty with a right turn out off 26 and headed North cuttin past Aston Down. I got a light sprinkling but avoided the worst by flying up to the edge of Gloucester and over the S bends in the Severn before tracking down the Welsh coastline. 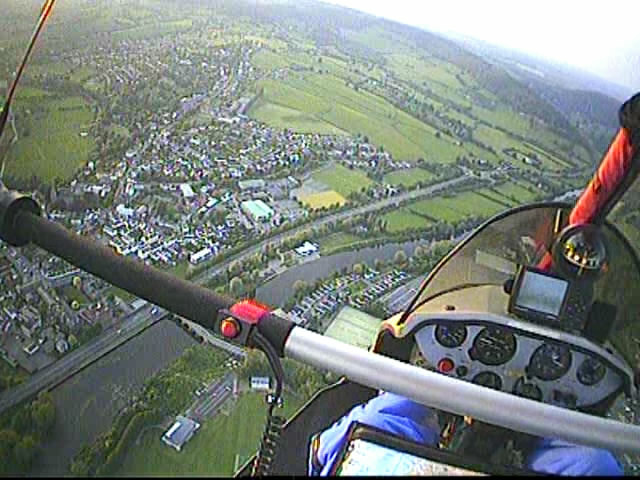 Back in the Usk valley it was nice weather and I encountered 2 hot air balloons very close to the airstrip, I joined overhead to look at the windsock but had to descend on the live side of the circuit due to the balloons. no other traffic though. Back on the ground I spent an hour moving two aircraft out of the hangar in the tight space available, mine in, those two back in etc. I’ve since learnt there will be another fixed wing too shortly and I’d be behind 3 of them but with only space in the yard to put two out there. Not sure how that will work ! I’ve made the right decision and look forward to getting involved with KFC again, this time with my own aircraft, it’s going to be fun. Oh yes, Red Sparrow running great on it’s serviced engine. 1900ish and I’m at the airfield preflight checking “red sparrow” for a lovely evening sortie. The temperature has dropped a bit, the thermals will have calmed, not a breath of wind, the blue sky beckons. Soon I’m in the air, enjoying the smooth air and listening to the dulcit tones of Cardiff Approach handling a string of easyjets and GA. I turn North and bimble off into the evening sky. 15 minutes later and I’m just North abeam the old Severn Bridge a couple of miles inland heading towards Monmouth. I have a balloon in my 12 o’clock a couple of thousand feet above me and about 5 miles away and I’m climbing up to meet him, will he be my friend? Well yes, I’d read a forum post only 2 days previously about whether balloons like microlights coming near them. The answer, yes, they like it, their passengers like it, much photosnapping opportunity ! However, they don’t like you going above them because ballons can climb very quickly and the pilots eyeline is obscured upwards by the balloon. 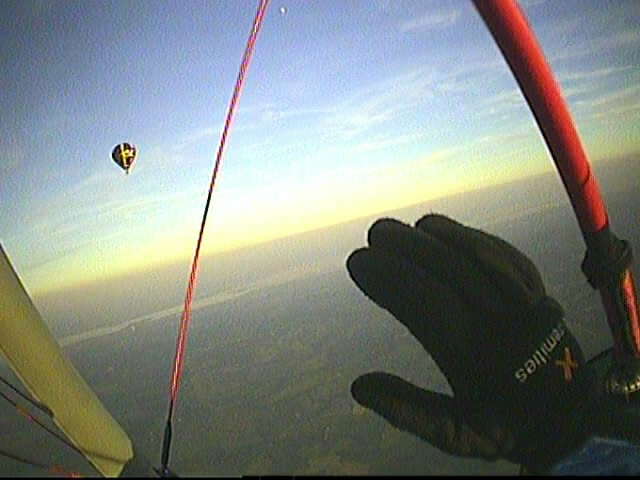 Recalling this and obeying the rules of the air (which stipulate powered aircraft give way to non-powered) I head to its right hand side and keeping a good safe distance I level off at the same height of 6500 feet amsl. The balloon is drifting in a southerly direction, which was towards me so having passed on it’s right hand side I turned left to pass around behind it allowing some waving at the baskets occupants. One loop around and with a waggle of my wing I bid it good evening and head off. Monmouth is attractive from the air, the river passes straight through it and is flanked by some nice old buildings including a private school and crossed by a nice bridge. I wave at a boat and a canoe below. The canoe has a team of four rowers and is zipping along leaving a long smooth wake and little dips where the oars had been ! After Monmouth I turn right a bit to run along the river Wye admiring it’s stunning sweeping horseshoe bends winding across the landscape flanked by rich green trees on its banks. I overfly Eastbach Farm airfield and then turn around dropping to 1000ft to overfly a site of memories from maybe 2 decades ago, a fantastic hedge maze near Symonds Yat. I’d been there previously with my parents and brother, when it was a young maze. It’s a great fun place run by two witty banter full twin brothers in stripey green jackets with red bow ties and straw boaters. They also tried to teach me to juggle ! They built the “jubilee maze” in 1977 and it’s since spawned a museum of mazes and seems to be going strong. The maze looks great from the air and other attractions seem to have sprung up around it. The sun is sinking into an orangey glow off to my right now, soon to sink below the hills, so I pull on some speed and whizz back Westwards to overfly Raglan Castle. “Kemeys traffic, golf-charlie-barvo-lima-xray, inbound from the North to join overhead at 2000ft on 1024″……….no response, seems I’m the only one flying this evening. Back at the field I descend on the dead side and do a lazy wide left hand circuit onto runway 31 and taxi up to the hangar. Click, click…..bbbbrrr,brr.brr……………mags off and the engine shuts down. Helmet off, suit off too, its still warm down here! The evening smells of the countryside are lovely, the birds are twittering, the sun is setting a deep orange casting long shadows from “red sparrow” as her engine emits happy creeks as she cools off. 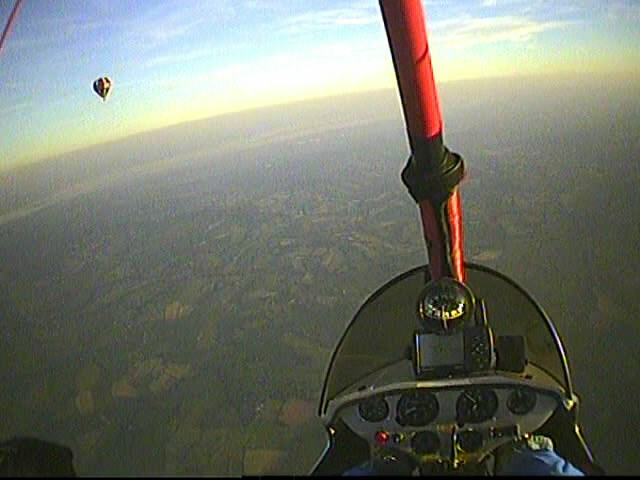 A perfect summer evening, such a privaledge to fly.